it's smile: What is Doctor? 8 thousand people each year, 8 thousand people pass final exams from the 81 medical universities of the country, among them, you are the top 80. Japan's medical system's future lies in your hands!! That was the prologue speech given in front of fresh intern in the very first page of the manga. Along with the story, we will be brought along tracing an intern life looking for his answer, "WHAT IS DOCTOR?". 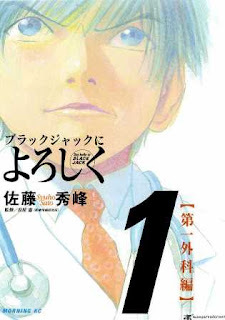 This independent series inspired by Black Jack follows the story of Saito Eijirou, a young doctor as he begins his internship at a Japanese hospital and encounters the frustration, exploitation, hypocrisy, corruption and financial chaos of the world of professional medicine. Appauled at the extreme unfairness of the system, and its apparent disregard for the welfare of both patients and doctors, he wishes that he could, like Black Jack, turn his back on the establishment and become a high-principled rogue doctor, but such a course is impossible for a young man of average skill trying to make his way in the real world. The series gives a very detailed and realistic portrait of the problems with the Japanese hospital system and the struggles of those who are trying to do their best despite it. It may fairly be called a portrait of someone who shares Black Jack’s principles but has to live in the real world. And then, I also happened to get a good reflection for myself, to get closer to the ideal doctor, no matter how rotten this world will be. Because deep in my heart, my only intention of becoming doctor is I want to save other lives. Please read below. Catatan: Ini adalah permenungan yang dituliskan oleh dr. Aditya Putra, yang kemarin dibacakan oleh dr. Alex Kusanto dalam pidatonya saat Sumpah Dokter FKUAJ Periode II/2011. Semoga bisa menjadi permenungan yang baik bagi para dokter. Jika Anda ingin menjadi dokter untuk bisa kaya raya, maka segeralah kemasi barang-barang Anda. Mungkin fakultas ekonomi lebih tepat untuk mendidik anda menjadi businessman bergelimang rupiah. Daripada Anda harus mengorbankan pasien dan keluarga Anda sendiri demi mengejar kekayaan.